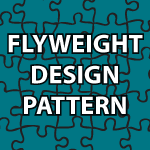 Welcome to my Flyweight Design Pattern Tutorial! The flyweight design pattern is used to dramatically increase the speed of your code when you are using many similar objects. To reduce memory usage the flyweight design pattern shares Objects that are the same rather than creating new ones. In this tutorial, I’ll create 100,000 rectangles and show you the difference in speed versus creating unique rectangle objects versus the flyweight design. The code follows to help you learn. Very nice tutorials. Thanks you! You’re very welcome 🙂 Thank you for taking the time to show your appreciation! Great job! You are my on-line teacher now. You’re awesome! Thanks to you I may have a chance to pass my final exam! Thank you 🙂 I wish you the best on your exam.